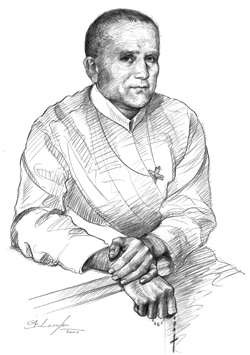 Today Redemptorists celebrate St. Clement Hofbauer (1751-1820). He established the northern European Redemptorists in an era when the Church was attacked by intellectuals, society, and government. He was surrounded by enemies but continued to love and forgive them. He fully lived the message of today’s Gospel to love one’s enemies. While in Warsaw, Poland, begging for funds for his orphanage, he entered a pub where a patron spit in his face. St. Clement responded peacefully, “That was for me. What about something for the orphans?” The patron was moved by his response and made a significant contribution. One holiday the Redemptorists in Warsaw were given a large ham. It was only after the meal that they realized it had been laced with poison that killed a few of them. St. Clement was able to forgive the unknown assassin and continue the mission of proclaiming the Redeemer’s love. Our Lenten journey is an opportune time to forgive and to love anyone who has offended you or whom you consider an enemy. Let the example of St. Clement help you fully live today’s Gospel by loving and forgiving your enemies. Learn more about St. Clement here.